2017 has been a big year for the Fighting Fantasy enthusiasts. Diehard fans of the legendary series of gamebooks have been spoiled for choice after a few lean years.. You Are The Hero 2 emerged from the pen of Jonathan Green, there was a second Fighting Fantasy Fest in London to coincide with YATH2’s release and Citadel Of Chaos bad boy Balthus Dire has been sculpted as a miniature courtesy of Otherworld Games.The original series of books are back on the shelves of bookstores republished by Scholastic along with an entirely new adventure Port Of Peril, a sequel to the classic City Of Thieves written by the gaffer himself Ian Livingstone. As if that wasn’t enough to get one’s teeth into we’ve now got an audio drama. The setting of The Hero’s Quest will be familiar to any legitimate fan of the series, having been directly inspired by TheWarlock Of Firetop Mountain. Following an encounter with 24 hour road man Zagor, the Warlock himself, elven warrior Vale Moonwing squads up with human rogue/adventurer Cassius Stormblade to tackle the mountain and knack the Warlock once and for all. If you played the book as a kid then many of the characters and situations our heroes experience will be familiar to you. It feels kind of nice, like basking in a warm Ready Brek glow whenever an old enemy crops up and I am reminded of how much pleasure and comfort I took from these titles as an introverted bookworm. The voice casting is solid. 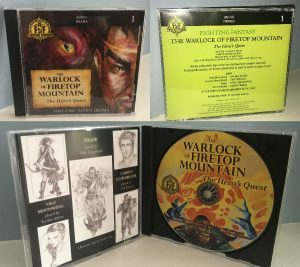 Genre veteran Toby Longworth (Warhammer/Black Library Audio) gives it some ham as Zagor the Warlock and seems to be thoroughly enjoying himself. Rachel Atkins has enough haughty self-assurance to pass herself off as a fairly convincing elf. However the Orcs, with their jarg Eastender’s accents, I could have happily done without. The production values are on point to. There’s an abundance of doomy sound effects and atmospheric music to ramp up the tension as the mystery of the Mountain unfolds, but having said that, I still felt like something was missing from the experience. Then I realised what It was that was absent. Me. For me the appeal of Fighting Fantasy was never the hugely generic European dark ages fantasy setting. Nor the expanded lore of Titan or it’s fearsome bestiary. No, It was being an active participant in the story. Making the decisions that dictated how events unfolded, to live and die by the luck of the dice. Interactive fiction they call it these days. Whilst it’s strangely nostalgic to listen to someone else having adventures in your old shoes, it also felt a lot like listening to someone else’s conversation and the novelty began to wear off quickly.